Carpentarian Grasswrens have received a lot of attention in recent years with a number of surveys failing to locate them in areas where they were known to occur. 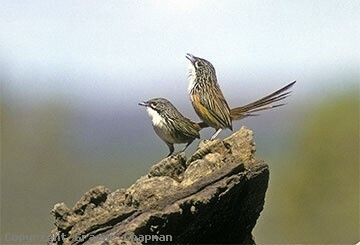 I photographed these birds in the 1980s in the Buckalara Range just south of Borroloola. They were in very rough sandstone country at the top of the range about a kilometre east of Caranbirini Waterhole. There was a faint track from the waterhole which leads down the creek and then eventually heads for higher ground on the north side of the creek to an area of rough sandstone plus thick spinifex (see pic 517204) - don't bother looking anywhere that has been burnt recently. Unfortunately nobody has reported seeing the birds in this area since 1995. The area around the waterhole is also an excellent birdwatching spot and the fascinating sandstone formations there are definitely worth some time to explore. 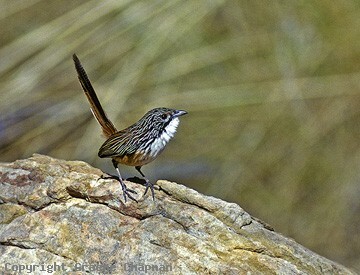 Carpentarian Grasswrens are also located quite close to Mt. Isa in more level country intersected by little gullies (517205), a very different habitat to the rocky ranges they inhabit further north. These little gullies support thicker vegetation than the open gravelly surrounds and no doubt provide suitable refuges for the grasswrens during extreme periods of climate. Further west they have also been seen along the Barkly Highway at the Burketown turnoff and again near the microwave tower just over 40 kms east of Camooweal. East of Mount Isa, the present known easterly limit appears to be a spot on the highway approx. 80 km north of Cloncurry. For results of a survey in 2008 see WINGSPAN magazine, September 2009 pages 23-25. 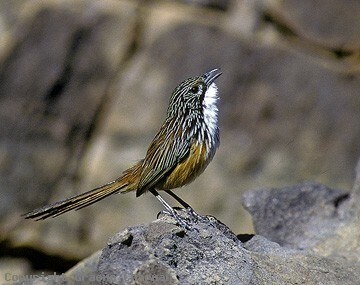 Carpentarians seem to be less gregarious than White-throated Grasswrens and most observations are only of a single bird or a pair. They also roam over fairly large territories which often makes them hard to locate. In recent times, people have more success at a well-known site along McNamaras road about 70 km NW of Mt. Isa (517205) than at Caranbirini which suffers a bit from frequent fires. Back in the 1990's a resident of Mt Isa, Peter Harris, undertook a private survey of Carpentarians in the Mt Isa district and the figure 517223 shows all the localities where he found them. More recent surveys have failed to find them in so many places. 517202 ... Adult pair, Buckalara Range - the male on the right. 517204 ... 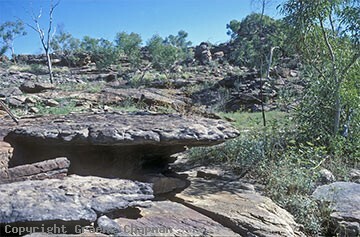 Rough sandstone habitat in Buckalara Ra. near Borroloola N.T.